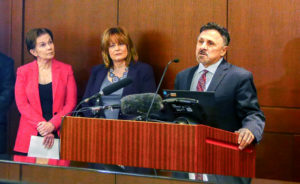 Former Columbine High School principal Frank DeAngelis often talks about the unexpected, long-lasting trauma he and the school community experienced after the 1999 school shooting. As he prepares for this month’s 20th remembrance of the Columbine tragedy that killed 12 students and a teacher, injured 24 others and impacted an entire community, DeAngelis says there’s an uneasy feeling. DeAngelis serves on the Board of Trustees for the Colorado Healing Fund. It’s the deep understanding of how mass violence affects people and communities, and the importance of resources for victims that drew him to the organization. DeAngelis says the reality of mass violence is that there’s no user manual on community healing or needs. But he believes the Colorado Healing Fund can identify needed resources by working with other Colorado victim assistance organizations. “The Colorado Healing Fund can get important information out about who needs help and make sure the public’s donations are going to the right place,” DeAngelis said. Twenty years later, Columbine still represents hope for our state and for the nation. Families of victims and survivors will dedicate this year’s events to remembrance, reflection and recommitment. “Sandy Hook and Parkland…these tragedies bring us together. It doesn’t matter what our personal beliefs may be, we put our differences aside. We say ‘Be kinder. Do better.’ And that’s what this year’s theme of Recommitment at Columbine is all about. We are the guiding light for others,” DeAngelis said.